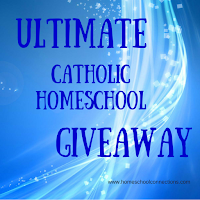 Our good friends at Homeschool Connections are hosting a giveaway. Not just any giveaway but the ULTIMATE Catholic Giveaway! They love giveaways and so do we! We are thrilled to be included and hope you will take some time too to look at their offerings this upcoming semester! They have put together several great prizes for 5 winners (1 prize per winner) including a $50 gift certificate from us…YEAH!! Just click on the picture below to get to the giveaway entrance form! Follow the instructions in the Rafflecopter widget. Get extra entries by entering daily. Contest ends Monday, January 4, 2016 at midnight. Please use our SHARE buttons to share this special offer from Homeschool Connections!